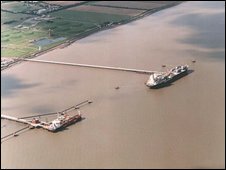 An experiment to harness tidal energy in the Humber estuary has begun with the aim of powering thousands of homes across the region. Equipment which will generate power from the water flow has been lowered into the estuary by engineers. The test device, about the size of a small car, has been put into the water at Stallingborough, close to Immingham. The prototype tidal power generator will be closely monitored by staff from Pulse Tidal, the firm behind the plan. The test generator is designed to work in shallow water to maximise its potential. The company said on its website that their technology could be deployed where water is less than 20m deep. "Much of the tidal resource in UK waters and elsewhere is less than 20 metres deep and is not suitable for technologies based on rotating turbines. "In many cases this gives Pulse exclusive access to the best located and easily exploited tidal power sites. "Shallow sites tend to be closer to shore where installation, connection and maintenance become more straightforward than in remote locations."